The Bufflehead is our smallest duck and one of the more common ducks spending the winter in Tennessee. The big white patch on the back of the male’s relatively large head makes this duck easy to identify at a distance. They can be found in small flocks throughout the state arriving around the end of October and staying until April. This is a cavity nesting duck that breeds near ponds and small lakes from central Alaska into eastern Canada. They spend the winter along both coasts, and inland across much of the United States. In the early 1900s, Bufflehead numbers were declining due to over hunting. As a result of management efforts, and despite year-to-year fluctuations, their numbers have more than doubled since the 1950s. Description: The male is striking with the large white patch on the back of his large black head. The head is actually iridescent purple and green in good light. His back is black, and the body is white. In flight, the wing has a white patch extending across the entire wing. The female is overall gray-brown, with a darker brown head that has a small oval white patch on the side. In flight, the white patch in the female’s wing is smaller than the male’s. Male Hooded Mergansers also have a large white patch on the head, but it is outlined in black, and the sides of the body are brown. Male Common Goldeneye have a small white patch on the head between the eye and the bill. The female has no white on the face. Habitat: In Tennessee, Buffleheads are found on ponds, rivers and lakes. Diet: Insects, crustaceans, and mollusks, as well as some seeds. Nesting and reproduction: There are no known nesting records for this species in Tennessee. 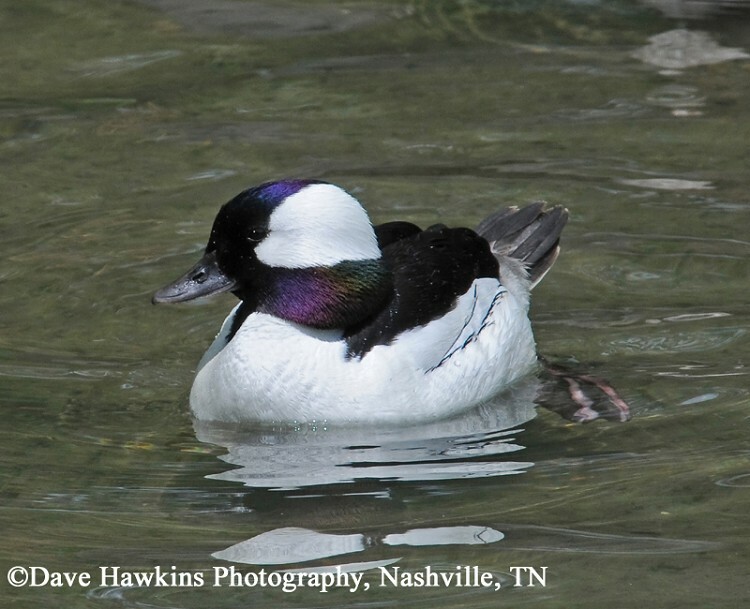 Status in Tennessee: The Bufflehead is a fairly common migrant and winter resident throughout the state. They arrive by late October and depart by late April. The Bufflehead is a cavity nesting duck and almost exclusively nests in holes excavated by Northern Flickers. Unlike most ducks, Buffleheads keep the same mate for several years. They usually return to the same territory, and often reuse the same nest site year after year. The oldest known Bufflehead in the wild was 18 years, 8 months old. Best places to see in Tennessee: Most ponds, rivers and lakes, and rivers across the state. Gauthier, Gilles. 1993. Bufflehead (Bucephala albeola). The Birds of North America, No. 67 (A. Poole and F. Gill, eds.). The Academy of Natural Sciences, Philadelphia, and The American Ornithologists' Union, Washington, D.C.